Surrounded by aquamarine glacial lakes and impressive mountain peaks, the small town of Atlin, BC is truly unique. Although Atlin is located in northern British Columbia, the only way to access it is through the Yukon. Atlin lies within the traditional territory of the Taku River Tlingit First Nation, but as elsewhere, the townsite of Atlin grew as a result of the Gold Rush. Thousands of settlers flocked to the region in 1898 and helped establish a busy mining field. The area remained popular well into the 1920s as a tourist destination. Known as the "Switzerland of the North," visitors and residents would arrive to Atlin by traveling north through the Inside Passage and the Alaskan Panhandle on a boat, then by catching a train to one of the two lake steamers that would cross Atlin Lake and bring them to town. 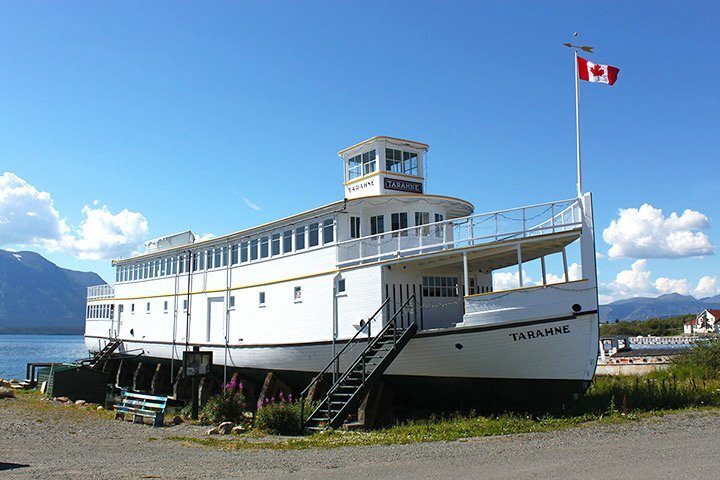 One steamer, the Tarahne, still sits on the shores of Atlin today. The Great Depression of the 1930s meant that both tourism and mining declined, and Atlin was abandoned. Residents were isolated until 1950, when the Atlin Road was completed. Today, Atlin is home to about 450 residents and some spectacular scenery. The Atlin Arts and Music Festival brings the town alive each year in July. You can reach Atlin by turning south off of the Alaska Highway near Jake's Corner onto the Atlin Road.